Dublin Zoo comes alive at night-time with the magic of Wild Lights, a festival of light featuring an enchanted lantern trail, a 16-meter high porcelain elephant tower and a 30-meter long Chinese dragon. The giant colourful lanterns and illuminated sculptures inspired by wildlife make this a must see attraction this festive season. There will also be Chinese performers, a selection of Chinese foods and a marketplace featuring handmade crafts from Chinese artists. 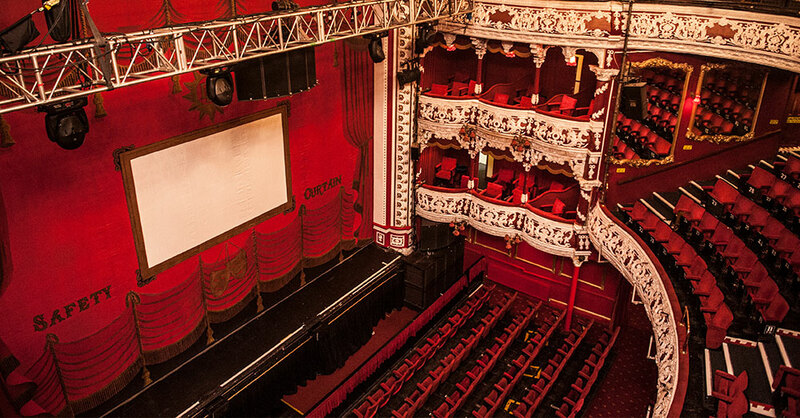 Whether it’s jeering Gaston in Dublin’s The Helix’s production of Beauty and the Beast or begging Rapunzel to let down her hair in the Gaiety Panto or laughing out-loud at Dustin the Turkey in Polly and the Beanstalk at the Olympia, Dublin has a pantomime to suit everyone. Are you a devoted follower of high street fashion or lover of unique, one-of-a-kind boutiques? Shopping in Dublin has it all – whether you’re shopping for Christmas presents, the perfect outfit for a Christmas party or looking to spoil yourself, there’s something for everyone and every budget. The Galway Christmas Market, based at Eyre Square, offers birds’ eye views of the 2020 European City of Culture on the Ferris wheel, the 'Galway EYE', and has traders from all over Ireland and Europe selling a variety of foods & crafts. With more than 50 wooden chalets as well as amusement rides, live music performances, puppet shows and carol singing, this is festive fun not to be missed! The Galway Christmas Market will be open from 6pm on Friday, 17th November until Friday, 22nd December. 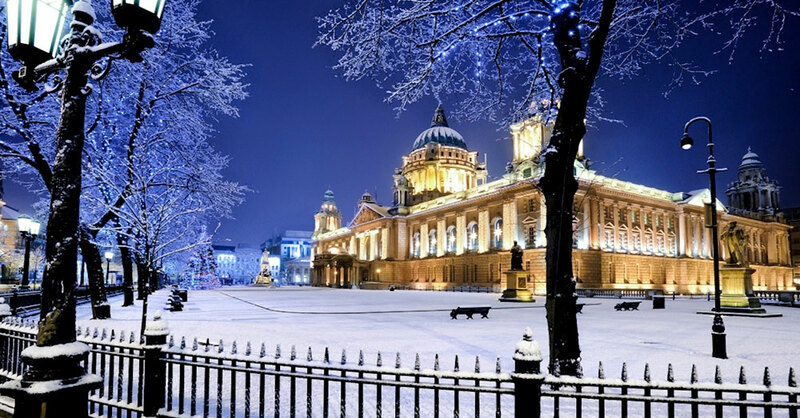 The Belfast Christmas Market has returned to the grounds of Belfast City Hall and runs until 8pm on Saturday, 23rd December. Over a hundred wooden chalets with festive garlands will offer a variety of tasty treats, handmade jewellery, Christmas decorations and more! Inside the gates of City Hall, visitors will find an exciting and delicious range of local and continental food. Discover the wonder of the Winterval Festival taking place in Waterford from November 17th through December 23rd. Waterford will be transformed in to Ireland’s Christmas capital - taking over the heart of the Medieval City, traditional log cabins will have a selection of items for sale from artisan foods, to handmade crafts, and Christmas decorations. There will also be festive themed activities such as 3D lightshows, the Winerval Express and the Animal Farm. GLOW is back in Bishop Lucey Park for December 2017. Get a birds-eye view of Cork city as you soar high above the park on a giant Ferris Wheel. If you’d rather keep your feet planted firmly on the ground, there is a selection of food and festive entrainment as well as a craft market this Christmas season. Munster Rugby and Leinster Rugby are set to meet again on 26th December for the second time this season during the Guinness Pro14. Leinster Rugby have won 4 of the last 7 games against Munster Rugby, winning 23–17 when the teams came head to head in October 2017. Located only 2.5km from Thomond Park, Travelodge Limerick Ennis Road is the perfect spot to rest your head after the game! The Christmas Festival at Limerick Racecourse is the perfect place for some post-Christmas fun! Taking place from 26th December until 29th December, enjoy festive and fabulous entertainment as you cheer the horses on from the stands at Greenmount Park. The National Hunt races will see some of Ireland's best horses tackle impressive hurdles as their jockeys strategise a winning gallop around the 11-furlong track. Skip the early start at Dublin Airport and relax with an overnight stay at Travelodge Dublin Airport South. Our shuttle bus will pick you up or drop you off at Dublin Airport, so you don’t need to worry about transfers. Have a ball at the Millennium Forum’s fun-fill pantomime, Cinderella. The classic tale of will Cinderella win her Prince? Will the glass slipper fit? Jam-packed with great songs and dances, magical special effects and a star studded cast; this is a Christmas treat not to be missed.